Celebrate SUPERNATURAL Season 9 With A FANGASM Giveaway! That’s Jared doing his ‘Fangasm’ impression for us – pretty realistic, don’t you think? 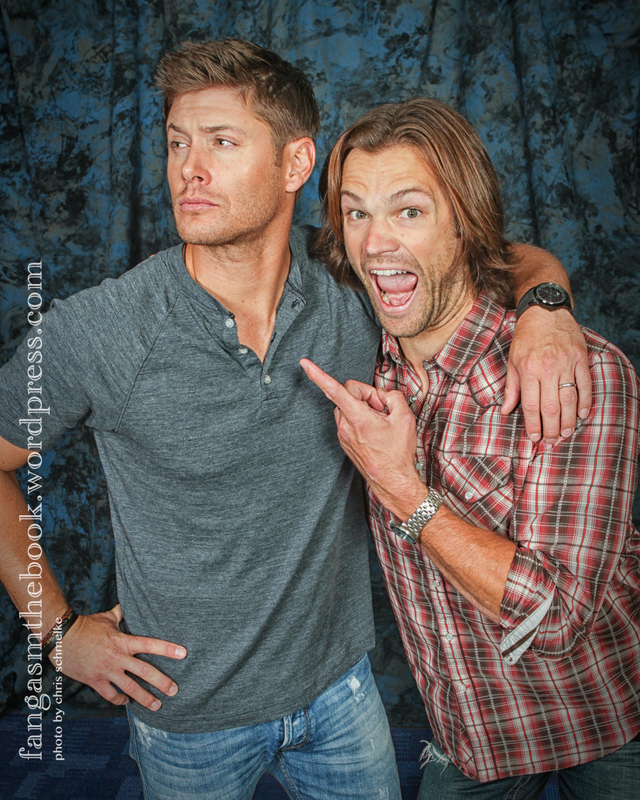 It’s one of the photos from our new book on Supernatural and its awesome fans, Fangasm, which goes on sale TODAY. Fangasm is our celebration of the best Show in the world, and the most wonderful fandom, the SPN Family. It’s the uncensored story of our love affair with SPN, and our five-year roadtrip through Supernatural fandom, from meeting hundreds of fellow fans who are now friends and SPN Family, to discovering the wild and wonderful world of online fandom and the too-much-fun-to-sleep craziness of conventions. We also take you behind the scenes and onto the set of Supernatural. Jared, Jensen, Misha, Jim, Richard, Samantha, Chad, and many other SPN actors and crew shared candid answers to our sometimes unexpected questions. Eric Kripke and Sera Gamble told us how they envisioned the show, and asked us as many questions as we asked them. Of course, none of this went smoothly, as we crisscrossed the US and Canada and our families and friends wondered if we’d lost our minds. We found ourselves in embarrassing situations far too often, and learned to laugh at ourselves every time we blundered into yet another one. Come along and laugh with us — but while you’re laughing, we hope the underlying message gets through, because it’s one we take seriously. Fandom changed us. For the better. Somewhere along the way, we figured out who we were and what we liked, even if it was a little sci fi genre television show that nobody else had ever heard of. No shame, fangirls and fanboys. We all deserve to be who we are and love what we want and to celebrate that passion! 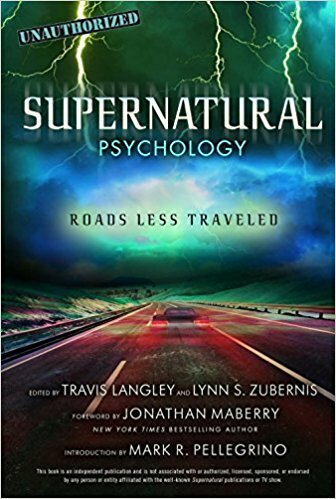 With lovely cover blurbs by the SPN fangirl behind the SuperWiki, Jules — Mo Ryan, television critic for the Huffington Post — and Tony Zierra and Elizabeth Yoffe, the producer and director of the provocative film My Big Break. Fill in the rest any way you want. Because Supernatural is awesome? Because I’m a fangirl too? For the chats with Misha – Jared — Jensen? For the pretty pictures? End your tweet with the hashtag #FreeFangasm and @FangasmSPN so the publisher can track the tweets and randomly select ten winners. You’ll get a free book, and the publisher will post your review on their website. Contest runs from 10/1 to 10/4. If you don’t want to wait, you can click the link at the top right of this page to order Fangasm now from Amazon. Happy reading! Thanks for helping us spread the word!! I would do it but I preordered and mine’s on the way from Amazon. It’s a great idea though. Yay! Look forward to hearing your thoughts! love supernatural even when I,m on the treadmill. reruns on tnt in the morning. love jared and Jensen as sam and dean. OMG CONGRATULATIONS, ladies! I knew Fangasm was coming but had forgotten and now it’s here. Forget a free copy I’m clicking the link to buy it now now now :D.
I will be sharing on FB as well to help reach a wider audience. Fangirl Style is the best style 🙂 Thank you so much, can’t wait to hear your thoughts! I’m ordering mine right now, have to check this out. Love anything that has to do with Supernatural and J2. But, but, but… I just finished mine ):) Loved it. As a recommendation for your next book, I’d love to read a book of fan stories as to why they were/are drawn to Supernatural. It’s it just for the pretty boys (and they are), were they genre fans already, or do they watch for the bond between the characters. I could probably write an entire chapter for you on the reasons the show resonates with me. Great work, ladies. I can’t wait for the next installment, whatever it may be. Great idea – we’d love to include more of that too (we have so much that just literally could not fit into one book!) Our next book will be in early 2014 – Fan Phenomena: Supernatural. It has chapters written by fans, academics, and SPN cast and crew too! Up to chapter 5. Got about 4 hours sleep. (Thanks, ladies) I am laughing and smiling the whole time. I do not want this book to end but can’t read it fast enough but I am reading every. single. word. How did you contain yourself enough to write so many coherent thoughts? Such a fun book! Yaaawwwwn!To be continued! I read your first book so I’m very excited to read this one. I, like christine above, watch TNT every day while doing my treadmill workout. Best way to work through the pain I’ve found yet. Winning this book would be totally awesome but if not, you can bet I will be buying it. since my tweets are protected & I can not tweet publicly may I write it here?! & fans, I really feel they are my family no one have mutual understand, care , anger, depression! happiness &… with me like spnfamily! I have lots memories… so I want to hear their stories too:)) empathy man empathy! !